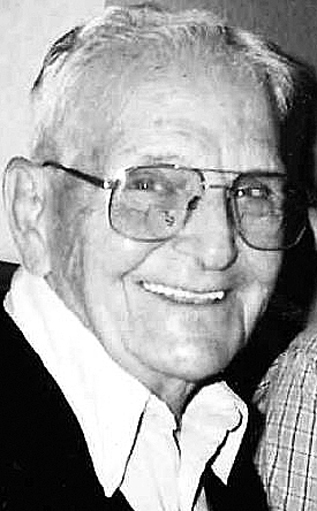 Charles (Mutt) Lachat, 100, passed away April 10, 2019 at Haven Skills. Charlie was born May 20, 1918 in Lock Haven, the son of the late Albert and Edna (Herr) Lachat and the oldest of 11 children. A veteran of the U.S. Army during WWII, Charlie was a construction supervisor. After his service he was employed for 35 years as a supervisor at the Bloomsburg Silk Mill in Lock Haven. Charlie was later employed at Piper Aircraft, Woolrich, Lock Haven University under the Green Thumb Program and at the Clinton County Prison. One of Charlie’s favorite past times was meeting some of his friends for coffee at Dunkin Donuts. He was easily recognized by the fedora hat that he always wore. Charles is survived by a son, Charles Jr. and wife Beverly, and a daughter Sandra Bechdel. Other survivors include two brothers, Lewis and Kenneth; two sisters, Betty Olmstead and Shirley Russell; four grandchildren, Rob Overdorf (Irene), Teri Cryder (Tom), Marce Orndorf (Nate) and Jennifer Wilson (Dave). Ten great-grandchildren and two great-great-grandsons. In addition to his parents Charlie was preceded in death by his wife of 60 plus years Ethel Bottorf; four brothers, Albert, Edward, William and Walter James; two sisters, Olive Zerbe and Catherine Lachat. Funeral services with full military honors for Charles Lachat will be held in the Bald Eagle United Presbyterian Church, 111 Main St., Mill Hall Saturday, April 13, 2019 at 11 a.m. Officiating will be Pastor Susan Champion. Family and friends will be received in the church, one hour prior to services. Interment will be in the Rest Haven Memorial Park. In lieu of flowers, memorials can be made in Charlie’s name to the Bald Eagle United Presbyterian Church. Services are under the direction of the Yost-Gedon Funeral Home & Cremation Services, LLC, 121 W. Main St. Lock Haven. Online thoughts and memories can be made at www.yost-gedonfuneralhome.com.